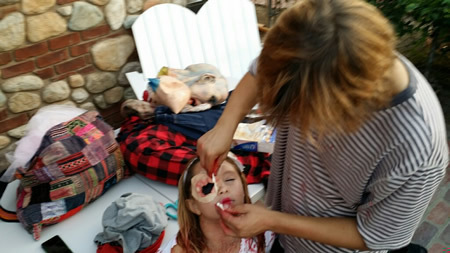 Patrick Saunders applies make-up to his sister, Peyton, one of the participants in the annual Halloween freak show. 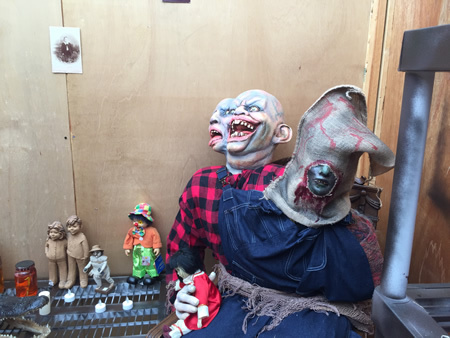 Three-headed monsters, body parts littering the ground, heart removal surgery and scary clowns that suddenly come to life are some of the treats in store for visitors to the annual Freak Show. A carnival theme animates this year’s show at the adult-oriented haunted house now in its fourth year, put on by the Saunders family. This year’s final show takes place on Saturday, Oct. 24, at 337 Bluebird Canyon Road. The creators, parents Ken and Christen Saunders and their children Patrick and Peyton, are already thinking about next year’s theme. Patrick sketches the scenes while his father executes them in plywood and two by fours. “It’s an event our family rallies around,” Ken Saunders said. Actors in the three October shows include Laguna Beach High School freshman Patrick, his friends and sister Peyton, a Top of the World student, all of whom enjoy tweaking the presentation from week to week. As word of the freak show spread, attendance increased and patrons began offering to pay for the privilege of walking through the haunted house. Taking the opportunity to turn a family passion into a fundraiser, the Saunders now accept a $2 donation. All proceeds go to a favorite charity of Christen Saunders, the Mauli Ola Foundation of Laguna Beach, started by surfers to introduce surfing to people with cystic fibrosis as a natural treatment.